When creating a scholarly paper, it is important to reference from where you drew your facts, ideas, and inspirations. There are many styles you might use - from APA to MLA (showing author & year) to Uniform Requirements (using a number only) to using a specific journal style. Properly using a reference requires knowledge about the citation style you need to use, so even though these tools do most of the heavy lifting - you still need to know a little about your style. For example, where, in your sentence, should the citation appear - is it at the end or somewhere in the middle of a sentence? Examples can help. We are building some quick examples, but for now, if you have any questions, check out the Purdue Owl. Type it out by hand using examples from style guides. The Purdue Owl is a great resource. Type all the information into one of the quick formatting tools. Pull in details from a database or catalog (no re-typing needed) to one of the other citation management tools so you can use & re-use them as needed (and have some extra options for organizing them and managing PDFs). There are lots of tools and several are highlighted on this guide. Below is an algorithm to help you figure out which tool is advised for your project. 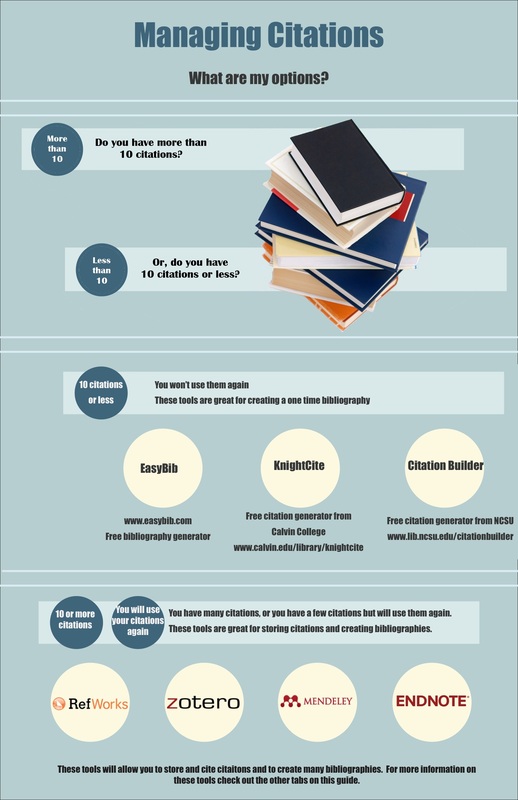 Click on either the Citation Software or the Citation Generators tab at the top to learn more about the tools mentioned in this infographic.